Pete Donald from High Wycombe, UK. a sick Harrier in three days). The remaining time was taken up with sightseeing and partying. I recall this event, as most unusual events brought out the news on T shirts within hours of the event. The major embarrassment was that the brown jobs dragged it back. Charles Collier's email brought back many memories of Changi. I was there for 2 years just before Charles, having been posted from Labuan. Although the Cargo Officer, I often had to stand in for one of the DAMOs. I well remember the first time we handled the VC10 after the Comet 4s. It was parked at the far end of the dispersal and immediately behind it on the other side of the wire fence was the back entrance to Changi which consisted of a sentry box (portaloo style) and a locally recruited policemen. This fine gentleman stood outside his sentry box to watch the VC10 taxi on its departure, but the back draught soon had him legging it up the track, quickly followed by his sentry box as the power increased. On one occasion I received a message from OPs that a Thai International Caravelle was about to land at Changi (later we heard that the pilot had mistaken Changi for Paya Leba!!!). As it taxied in we were waiting with the Spurlings and quickly got them to their lowest height when we saw how low the Caravelle was. When we got the steps to the front port door the steps sill was halfway up the open door. Imagine my embarrassment when, down on my hands and knees talking to the highly amused Thai crew through the gap that was left, all the passengers calmly walked off the steps at the rear of the aircraft.....Whoops! One evening I was driving in to work to do my night shift and was stopped at the lights where the road crossed the taxiway. A RMAF Dart Herald was landing at the time and its nose wheel collapsed sending an enormous shower of sparks into the night sky. 20 years later whilst serving with SOAF a large group of us were having our monthly Chinese meal at a restaurant in Qurum and were swapping yarns, when I quoted this one. "Yes, I remember it well" said Ron Williams (SOAF C130 pilot). "I was driving the bloody thing". Labuan and Changi were great tours, only to be outdone by Gan. As I now approach my old age, the memories start to flood back, the trouble is I can't seem to remember what happened only hours or even minutes ago!!! Since I did the story on the “Popping York” a few weeks ago I've become hooked on the York and done a little research and I've put a small record together of the various VIP aircraft as follows that might be of interest. The first four Yorks to be built were prototypes, LV626, LV629, LV633 and LV639. LV633 was prepared as a VIP aircraft for the use of Sir Winston Churchill; it was named Ascalon. It was his wartime flying conference room and equipped with a stateroom and sleeping berth. He used it to meet Roosevelt at Casablanca in 1943 and in February 1945 at Yalta where they also met Stalin and again in July with Truman and Stalin again.It was also used to convey King George V1 in 1943 to North Africa to review the 1st and 6th armies and units of the US 5th Army. It was also used along with MW100 to ferry VIP’s to the Teheran conference. In September 1951 it was allotted as a VIP transport to FEAF until 1954; it then returned to the UK and was eventually broken up in June 54. The first production Yorks were MW100, MW101 and MW102 and were all fitted out to VIP standard. MW101 also built similar to MW100 for similar use and it was used by Field Montgomery for his visit to the Far East, Australia and New Zealand in June 1947 and probably staged through Mauripur; this aircraft also survived until 1955 when it was sold as scrap to British Aluminium Co.
MW102 was prepared in VIP mode for the personal use in 1944 of Earl Mountbatton as C in C Far East Command and as Viceroy of India March to August 1947 and finally as Governor General of India August 1947 to June 1948. In 1945 it was used to evacuate POW’s from Singapore to India as was MW140 used to return Aussi POW’s home to Oz. In 1948 it returned to UK and was modified with long range fuel tanks being fitted and joined the Far East Command at Changi where in 1950 suffered damage on landing and was struck off charge on the 31st December 1950. In 1945 the RAAF accepted delivery of MW140 for the new Governor General of Australia HRH The Duke of Gloucester. The aircraft was flown from England to Canberra and joined the Governor Generals Communication Flight in April 1945 and the RAAF identification number A74 was allocated; the York retained the original serial number MV140 but the RAF markings were exchanged for the contemporary RAAF blue and white roundels and flashes. In addition the GG’s cipher and the name ‘Endeavour’ in honour of Captain Cook’s ship were painted near the cockpit on the highly polished fuselage. It had two staterooms and main saloon for VIP passengers. The York was used on long range flights including the GG’s tour of New Guinea, New Britain and Bougainville. The flight was terminated on July 5th 1945 because of the death of the Prime Minister John Curtan. As said previous on two occasions. September 20th 1945 and October 5th 1945 ‘Endeavor was flown to Singapore to evacuate ex POW’s back to Australia. On January 17th 1947 ‘Endeavour’ departed Mascot and arrived in England on January 23rd 1947 and handed back to the Air Ministry and was taken on strength with 24 Sqdn from 1948 to 1952 when it was withdrawn from service and stored at RAF 12MU Kirkbride then on to Aviation Jersey in 1954 and a little later broken up. The longest serving York with the RAF was MW295 named Ascalon 11 and spent its final years in the Far East at Changi until 1957. Was sold in that year to Field Aircraft Services registered as G-APCA. MW169 was transferred to the French Air Force in June 1945 for the use of General de Gaulle which he used for a visit to Washington. It was returned to UK in November 1946 for overhaul and returned to Orly in April 1947 for further VIP work and was later joined by three other Yorks MW137, MW234 and MW 243 which were purchased from the RAF and survived until 1963. MW173 was converted to VIP mode in October 1946 for the use of Air Vice Marshall Keith Park and named Zipper after the war and based at Singapore. Returned to UK and sold as scrap to Eyre Smelting Co in 1954; it’s fittings transferred to MW325..
MW 325 converted to VIP mode from fittings taken from MW173. Was sold as scrap in 1955 to British Aluminium Co.
An order for the manufacture of 50 Yorks was given to Victory Aircraft in Canada but in fact only one was produced FM400 which was delivered to the RAF in January 1945 but due to change in policy the order was cancelled. There is a well preserved York at the RAF Museum Cosford and is in RAF colours and is numbered as being MW100 but in actual fact was built as G-AGNV; one of twenty five built especially for BOAC. Most of the foregoing I’ve gleaned from a publication from the late 50’s/early 60’s in Chris Ashworth’s Avro York in RAF service 1942-1957 which I recently obtained and in which there are half a dozen photographs of Yorks at Mauripur submitted by R C Sturtivant, a member of The RAF Mauripur Association, and also from the RAAF Museum website. Also if you look at the 24 Sqdn newsletters they’ve used the same book on some of their issues and there are also some interesting memories from their members who were involved on Yorks. It makes very interesting reading. The new Ensign was assigned to subs, where he'd dreamed of working since a young boy. He was trying to impress the Chief with his expertise learned in submarine school. The Chief cut him off quickly and said, "Listen, 'sir', it's real simple. Add the number of times we dive to the number of times we surface. Divide that number by two. If the result doesn't come out even, don't open the hatch." This is another tale in my life, but before I qualified as a "Mover". 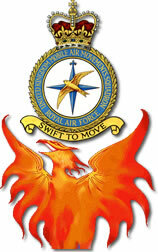 On commissioning as an equipment officer in 1965 my first appointment was to RAF Steamer Point, Aden. Exciting and exacting times as you can imagine, but nevertheless we all enjoyed ourselves. I had some leave so I elected to travel to see some French friends in Djibouti (I was secretary to the Aden Forces Pistol Club and we had an annual shoot against the French forces in Djibouti) . Travel out was from RAF Khormaksar Airport in an Air Djibouti DC3 Dakota. The small airline was run by a French Count and a motley crew of European pilots! It was a three times a week service Djibouti to Aden and return. So, I arrived for the flight out with a mixed bag of Arabs and Somalis and about three goats and two chickens! Seating became a bit difficult whereupon the pilot (the French Count) beckoned to me to come forward into the cockpit. He sat me down in the old radio operators seat which was vacant. We took off; reached operating height, the autopilot was functioning heading for the African coast - an hour and half journey. The captain got out of his left hand seat and offered it to me as he wished to see how his passengers and animals were coping. I was enjoying myself pretending to be the captain of the DC3 when the real captain returned. I started to get up but he stopped me and said that he would sit in the radio operators seat for a while. I was elated as the view was stunning over the Red Sea and Gulf of Aden. However, my elation soon died when I glanced at the co-pilot in the right hand seat, a portly spanish type with a large black moustache - fast asleep! To my horror I looked back at the captain and he had his feet up on the operators table and he was slumbering! There I was in control of a transport with some 20 passengers and the two pilots asleep. I knew we were on autopilot and if the radio came on it would wake the co-pilot as he was wearing headphones so my alarm lessened. I kept a watching brief out of the window and I saw the African coast in the distance. As we got closer, I could just perceive the town of Djibouti and the airport runway came into view. I was just about to waken the crew when the both came into instant action - took control and landed a the aircraft without further incident. We all disembarked but I was the only one who knew what had been happening! Think of this when you next take a commercial flight - don't worry though - times have changed for the better since then! He was in an odd mood Saturday night. We planned to meet at a pub for a drink, I spent the afternoon shopping with the girls and I thought it might have been my fault because I was a bit later than I promised, but he didn't say anything much about it. The conversation was very slow going so I thought we should go off somewhere more intimate so we could talk more privately. We went to this restaurant and he was still acting a bit funny, so I tried to cheer him up and started to wonder whether it was me or something else. I asked him, and he said no but I wasn't really sure. So anyway, in the car on the way back home I said that I loved him deeply and he just put his arm around me. I didn't know what the hell that meant because you know he didn't say it back or anything, this is really worrying me. We finally got back home and I was wondering if he was going to leave me! So I tried to get him to talk but he just switched on the TV and sat with a distant look in his eyes that seemed to say 'its all over between us'. Reluctantly, I said I was going to bed, then after about 10 minutes, he joined me and to my surprise he responded to my advances and we made love. But he still seemed really distracted, so afterwards I just wanted to confront him but I just cried myself to sleep. I just don't know what to do anymore. I mean, I really think he is seeing someone else and that my life is a disaster. England lost. Got a shag though. New on the site this week: I've added "Operation Agila" to the Articles pages, and also put up a new Mystery Photograph.